Jonathan Fisher is Pottawattami, Muckwa Dodem (Bear Clan) from the Wikwemikong Unceded Indian Reserve, Three Fires Confederacy on Manitoulin Island, Ontario. He has performed as an actor, dancer and singer in productions across Canada and USA. 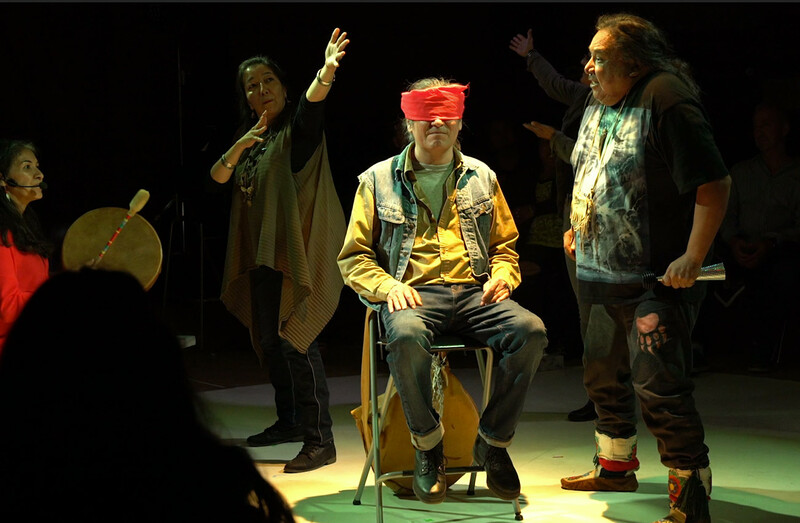 Favourite roles include Jayko/Candy Man in “Night” (Human Cargo), Lupi in “Lupi, The Great White Wolf” (De-ba-jeh-mu-jig Theatre Group) in the Anishnabe language. 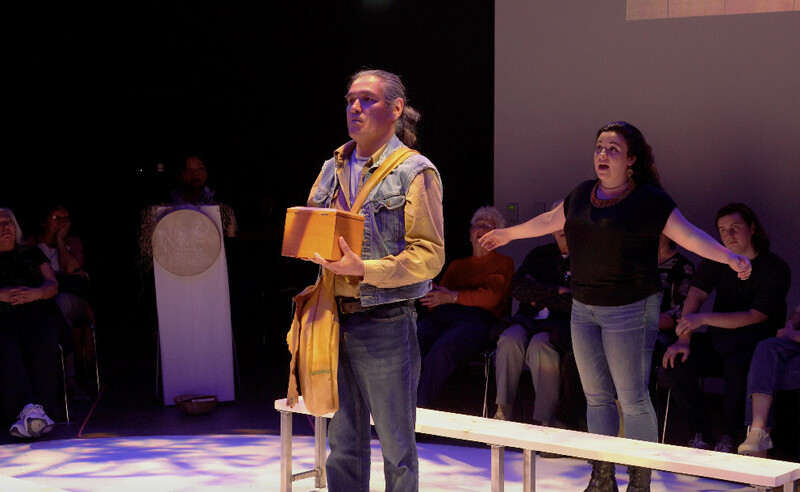 John Pai in “The Indolent Boys” (Syracuse Stage), Almighty Voice in “Almighty Voice & His Wife” (Native Earth), Creature Nataways in “Dry Lips Oughta Move to Kapuskasing” (Red Roots Theatre), Mark in “Time Stands Still” (Native Earth), and in Ian Ross’ Governor General Award winning play “farewel” (Prairie Theatre Exchange/Great Canadian Theatre Company/Traverse Theatre), for which he performed at the Edinburgh Fringe Festival. Jonathan has performed in Prague, Czech Republic across Canada, the U.S. and at the Aboriginal festival in Woodford, Australia. My name is Jonathan Fisher and I play Old One. And where are you from, Jonathan? I am from the Wikwemikong Unceded Indian Reserve, Manitoulin Island Ontario, the largest fresh water island in the world, Three Fires Confederacy. How has this process been for you, playing Old One? It’s been a challenge I guess, because it deals with a lot of heavy issues around residential school and missing and murdered Indigenous women, the collapse of the fishing industry on the West Coast. So, it’s a challenge. How do you find your way through that? I have to fall back on my training, which is as an actor, which is about keeping myself grounded and just knowing when to breathe, and having control of breath to sort of get my way around the emotions of the character in certain scenes. What have been some of the highlights for you, of the entire journey so far? Well because we’re on the road and with each venue we go to the show is different, it changes and it adapts to the new spaces that we play in and the audiences are always different from whatever city we’re playing in. The audience reacts in different ways to different parts of the show. So the changing nature of it has been a highlight? 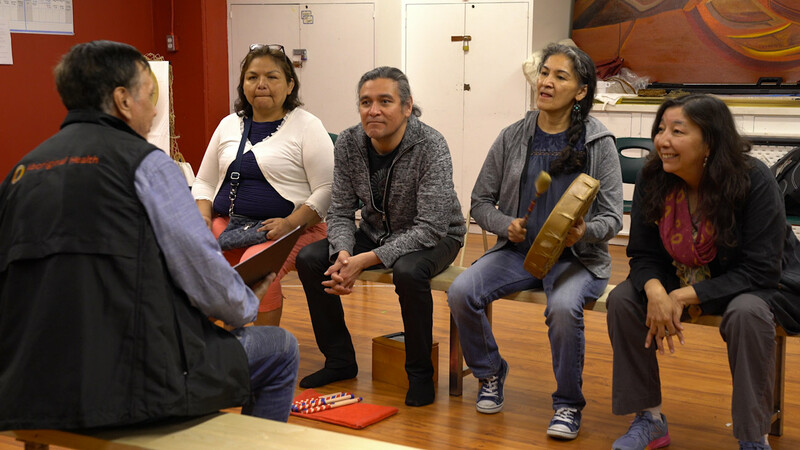 The changing and just to witness how powerful it can impact certain audience members, whether they have a connection to being a residential school survivor or have a wife, sister, and auntie or a niece that’s missing or murdered. Hope. Humour. There’s a lot of humour in the show that helps the audience to digest it. I think it leaves them with a lot of answers to certain issues that some people in Canada, I guess non-indigenous people aren’t really aware of. What would reconciliation mean to you? What would that mean to me? I don’t know… It’s I guess being an artist and an indigenous artist. I go through that process every time for myself, whenever I do a show that has a lot of these issues. So I don’t know. I guess there’s a quote that I’d like to say that’s “An artist is someone who is endlessly healing their wounds and at the same time constantly exposing them.” Dealing with heavy issues like that is personal reconciliation. I think it’s also a reconciliation on the audience.